Every member of 542 and our Associates is invited! Annual VVA 542 and Vietnamese community picnic. A great time to swim, listen to live entertainment, enjoy great food. The Lt Governor will be in attendance and invites have also been extended to the Mayor of Harrisburg Stephen R. Reed as well as several members of the Active Military. The State VVA meeting at the Hilton in downtown Harrisburg. On Friday the 29th a UH-1 Huey helicopter will land at City Island and be towed across the Market Street Bridge to in front of the Hilton where it will be on static display all weekend. On Saturday at 4:00 PM there will be a POW/MIA ceremony in front of the Hilton with many invited guests. The names of the Pennsylvanian’s who are still listed as missing in action from the Vietnam War will be read. The National Quilt of tears will be on display in the Hilton and Pennsylvania will present 3 more panels listing over 90 veterans who have died from Agent Orange related illnesses. There will be the East Coast premier of a new movie from Arrow Head Films, “An Ocean Away”, describing the discovery and return of the remains of a U.S. Marine listed as missing in action for over 38 years. The weekend will be dedicated to VVA 542 Chapter member U.S. Navy Capt. Ed Davis who was a POW for over 7 years in North Vietnam. Harrisburg’s Holiday Parade. Once again VVA 542 has been tasked by the Mayor with organizing the 1st division of the Parade which will consist of Active duty units back from Iraq and Afghanistan, as well as many Veterans organizations. Last years parade started with a fly over of 4 UH-60 BlackHawk helicopters and we plan an even better start this year. On May 26th The West Perry High School will dedicate it's memorial to the Vietnam War. VVA 542 working with the school will fly in in a UH-1 Huey and participate in the program. All chapter members are welcome to be there. 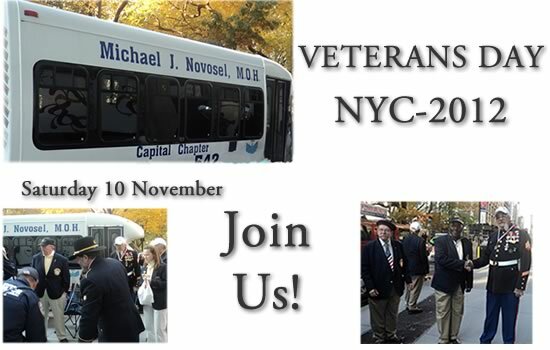 We will provide our members to interact with the students to educate them on the Vietnam War. As we did with Bishop McDevitt and Harrisburg High School, we will sponsor an essay contest with a prize of $250 to the student with the winning essay on the Vietnam War. VVA 542 will again participate in the One Wing Lifts All event at Capitol City Airport In May. We are coordinating with the Adjutant General Of Pennsylvania to provide a UH-60 Blackhawk helicopter for the event. On February 1st at the Harrisburg City Center VVA 542 will present Harrisburg Mayor Stephen R. Reed with a flag flown over Iraq as part of "Operation Iraqi Freedom" in appreciation for the Mayor's continuing support of the Military and Veterans. VVA 542 will again host the Lebanon VA Hospital Christmas Party. Thanks to Kathleen Torchia and Capitol Opera we will provide a holiday entertainment program. With the outstanding cooperation of Cathy Keister President of AVVA 542 we will also provide refreshments for the patients. VVA 542 will present a Christmas gift to each in patient and visit the wards of those patients unable to attend the program. The event is set for Saturday December 17th at 2 PM at the VA hospital in Lebanon. See you there. VVA 542 will host the U.S. Marines of Echo Company at their family day Saturday December 3rd at Camp Curtin School. We will provide approximatly 400 meals as well as provide entertainment to 109 Marines who are deploying to Iraq as well as their Family members. We invite all our members to attend, many of our chapter members have volunteered to help serve the food.